Persian dance and music sponsored by the Iranian-American Cultural Society of Maryland with guest artists, Mitra, and pianist Jamshid Bastani. Benefit for the Library of Alexandria, Egypt. SRDC performed a preview from the Ancient Egyptian dance suite, ''Egypta,'' and a performance of contemporary Egyptian dances. Sponsored by the Iranian Community with featured guest artist Qizlarhon Dusmuhamedova, People’s Artist of Uzbekistan. Silk Road Dance Company's debut performance of Persian dance in the Metro DC area. 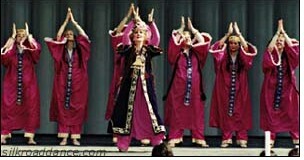 Silk Road Dance Company's other past performances in 1996 and 1997 include presentations at Casablanca Restaurant, weddings, and recitals. Modern Egyptian folklore and Ancient Egyptian dance. Turkic and Iranian dances by the Silk Road Dance Company and guest performers. Silk Road Dance Company performs traditional Uzbek, Turkish and Azerbaijani dance. Silk Road Dance Company presents folkloric and contemporary North African and Egyptian dances for a wedding celebration, including the traditional zeffa procession. SRDC presents dances of Iran and Egypt. Student recital with guest performances by Silk Road Dance Company. Concert featuring guest star Nadia Hamdi, direct from Egypt, with performances by the Silk Road Dance Company and others. Persian heritage celebration featuring Persian dance.